I've been too damn busy with work lately, and I'm not happy about it. It is always bad this time of year, but I don't remember it being this bad. Despite technically having Good Friday off, I spent the day trying to catch up. I really could have used a break, but it was not in the cards. I barely had time to reflect on how so many of my neighbors seem to be quite fond of torture or to celebrate the arrival of Zombie Jesus weekend. I got quite a bit done, but it just wasn't enough. I had little choice but to work most of Saturday too, completely missing the many Zombie Jesus festivities (most of which are happening only in my imagination). And now that Zombie Jesus Day is finally here (along with April Fools' Day), I find myself working again. As you can see, I'm not even taking the time to write a proper Easter post! I haven't even visited "the Facebook" to see Christians quoting passages from some book at atheists. It is not that I had plans or anything, but I was going to at least try to watch Day of the Dead. Maybe I'll still be able to do that tonight before Zombie Jesus weekend wraps up. I will say that there's been one upside to being this busy. I'm finally starting to realize that some of my perfectionistic tendencies are getting in my way. And because I cannot accomplish all I need to at the level I'd like, I'm having to lower my standards and focus more on getting things done even if it means they could be done better. This has been a struggle for some time, but I think it might be starting to get a little bit easier. And if so, that is definitely something positive. 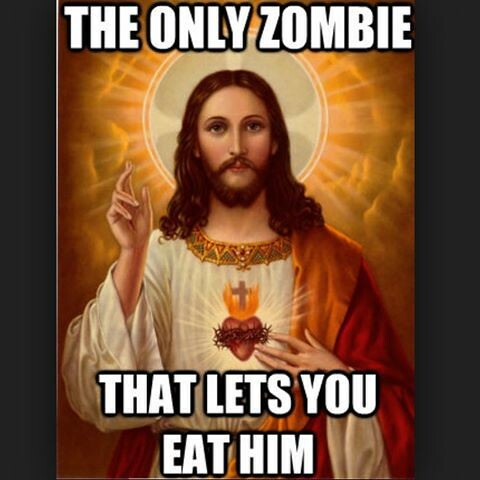 Happy Zombie Jesus Day to those of you who are taking the time to celebrate (or at least mock) it. I hope you have a good one.